The room erupted in youthful vigor as the preschoolers rolled onto the bouncy balls. Their buzzing energy remained as a group of second-year Physical Therapy students kept them focused and entertained. 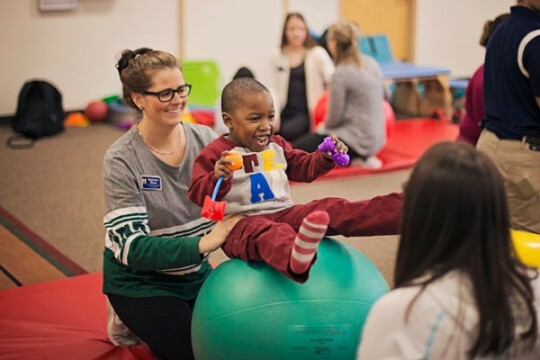 “You can hear how much they love it,” Michele Lambaria, a UM-Flint Clinical Assistant Professor in Physical Therapy said, as children from the university’s Early Childhood Development Center worked with her students. The youngsters were having fun, but the physical therapy students were actually helping them work on balance, muscle strengthening techniques, and other physical developments, using therapy balls. The scene plays out once a week for Lambaria’s pediatric physical therapy class within the William S. White Building. 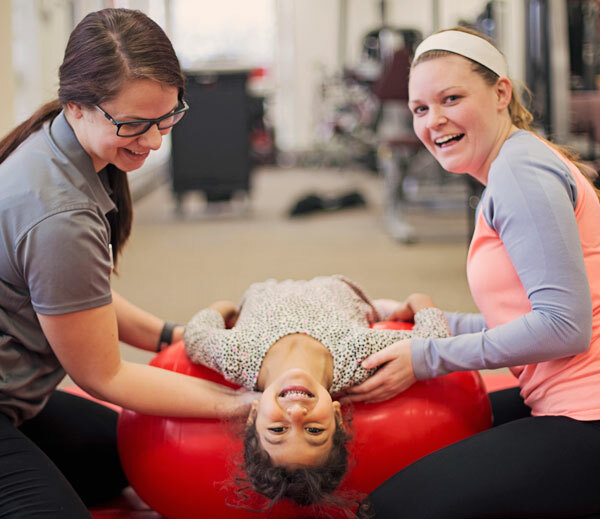 Each week, the physical therapy students work with a group of ECDC children on fine motor skills, muscle development, sensory engagement, and other skills. The children include groups of infants, toddlers and preschoolers, depending on the session. UM-Flint physical therapy students make learning feel like play. The partnership between the ECDC and Physical Therapy is mutually rewarding, organizers said. The university students utilize and hone their practical skills, and the children may receive diagnosis and further treatment. The students also work with children with developmental challenges, such as cerebral palsy. Della Becker-Cornell, director of the ECDC, said the physical therapy students and faculty can spot developmental delays. “Their keen eye is amazing in that regard,” Becker-Cornell said, adding that parents of the children are always involved when anything is noticed or decided. 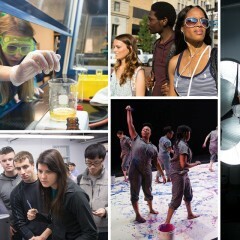 “The children think it’s the greatest thing in the world to go play in the labs,” she said. Alex Kamp, a second-year physical therapy student in Lambaria’s class said working with the children spurs flexibility of treatment. “You are constantly adapting to what the kids like and what they don’t like, and if you find something they do like, how you can reward them with that activity,” said Kamp. Second-year physical therapy student Hanna Ribner said the work with children helps prepare her and her peers for all patients. The PT students are learning how to redirect patients’ attentions, come up with ideas on the spot, and work with the patients’ particular set of needs. “It helps with everybody,” she said. Marissa McCann, a UM-Flint elementary education student, and an assistant teacher at the ECDC, said the program boosts the campus community. 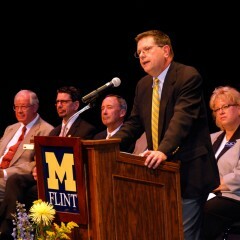 Many UM-Flint employees have children at the center. And the youngsters like the idea of helping the PT students too, she said. “The kids, they really like it. They feel they are helping the physical therapy students learn,” McCann said.